The Forest Enterprises team is focussed on our number one priority of achieving the best possible outcome from your harvest and securing future opportunities for the next generation of forestry investors. Underway is the complex task of scheduling the harvest of our entire managed estate and working through the mechanics of combined harvest programmes. This undertaking is essential to the proposals underway for group harvests and second rotation forestry investments. We are preparing for the launch of two new issue investments this year, and will bring you news of this exciting opportunity soon. 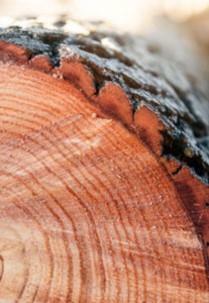 Forestry is experiencing a high public profile for reasons both positive and negative. During our recent visit from Associate Forestry Minister, Hon. Meka Whaitiri we discussed a range of issues and opportunities for forestry businesses like ours. One Billion Trees, we believe, is the best thing to happen to forestry in 20 years. And may the current sales trend continue of strong demand and good pricing for all log grades. But we stand with the industry in saying the catastrophic effects from the recent severe weather in Gisborne is unacceptable and change is required. Fortunately, we had no adverse impacts from this weather event, however we are looking very hard at what we do. Our investors should be in no doubt that Forest Enterprises will continue to be a prudent forest manager, responsible neighbour, and committed to best practice. Resuming regular communication with you has also been a priority and I’m pleased to bring you these updates. Please read on. Winter heralds the replanting season. Following harvest, Forest Enterprises replants all the land it owns or manages. 469,000 trees will be planted this year between June and August/September – 345,000 in Wairarapa (with two silviculture crews) and 124,000 in Gisborne (one crew). The winter months also bring the usual challenges for roading and harvest operations. Wet ground conditions slow the pace of logging and road building, and means increased road maintenance. Despite recent storms in Wairarapa, only one production day was lost in some areas due to public roads being flooded. These are normal winter conditions. On 1 May, the new National Environmental Standard for Plantation Forestry (NES-PF) came into force. These are nationally consistent regulations that cover eight core activities over the life-cycle of the plantation forest. The NES-PF’s objectives are to maintain or improve environmental outcomes associated with plantation forestry, and increase efficiencies and certainty in forest management. 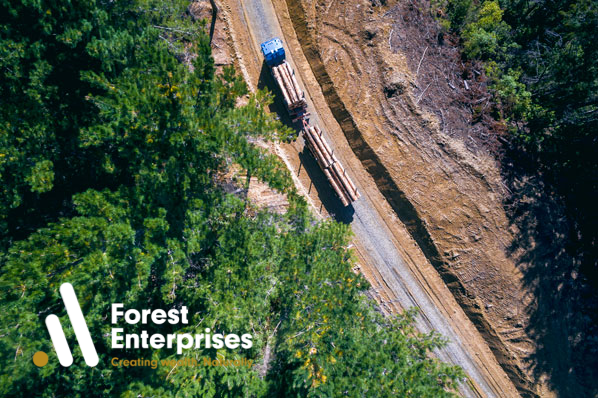 For Forest Enterprises, this means a consistent approach to resource consents across our three operating regions, the Wairarapa, Gisborne and Hawkes Bay. Expected harvest volume in 2018 is over half a million tonnes. 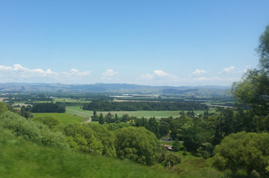 Approximately 375,000 tonnes is from our Wairarapa forests, and 210,000 tonnes from Gisborne. This is 46% more volume than 2017. In the Wairarapa this year, we are harvesting in a total of 13 forests, four of which are planned to conclude by the year end, ready for their second rotation investments. Seven logging crews are operational, with a mix of ground-based and hauler harvesting. 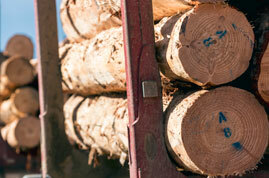 Up to 40% of our Wairarapa harvest volume is supplied to local mills like Kiwi Lumber Masterton. The rest is sent mostly by rail to CentrePort Wellington for export. We are also attempting to increase our volume harvested by over 15% as crop age classes reach maturity. This means roughly an additional 1,900 truck-loads of logs from our forests, posing challenges throughout the supply chain, from logging crews, to cartage contractors, rail and port. We are commencing harvest in six forests in Gisborne this year bringing our harvest total to nine forests. One logging crew is currently operational and another two start in the spring. We believe these are the three top logging crews in Gisborne. Almost all of our Gisborne harvest volume is exported via Eastland Port. We reported to clients in May that our Gisborne operation is expanding as we bring all forest and harvest management for the region in-house. Beginning Monday 18 June, we are operational at our new Gisborne premises at 241 Stanley Road. Recruitment is almost complete for two new Gisborne-based roles, Tree Crop Forester and Harvest Forester. We are confident we will fill both roles with exceptional people. On 1 April, long-serving Forest Enterprises owner Steve Wilton sold the last of his shareholding to existing company executives as planned. 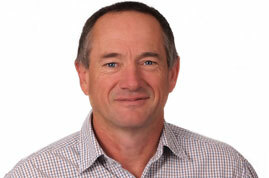 Gisborne Regional Manager, Dan Fraser became a shareholder. And at the same time, directors Bert Hughes (CEO, pictured), Graeme Tindall and Gordon Wong, plus Malte Coulmann, all increased their shareholdings. Five new roles have been created at Forest Enterprises in the last six months, to keep pace with the growth of our harvest business. 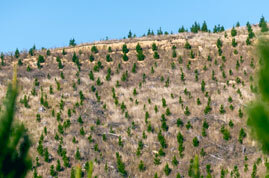 We will soon have two new forestry staff in Gisborne. In Masterton, we’ve welcomed Silvia Sze as Distribution & Roading Manager and Steve Croskery as Forestry Projects Manager; plus we are currently recruiting for an assistant to support our busy administration team. The Autumn 2018 edition of the Bulletin has the latest forestry news from around New Zealand. 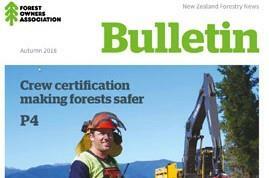 The Bulletin is published three times a year by the New Zealand Forest Owners Association (FOA). Your forest is part of 1.7 million hectare national estate which is a significant part of the New Zealand economy as the fourth largest export earner. 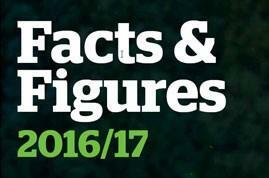 Facts & Figures is a very readable summary of New Zealand’s key forestry stats. This 2016/2017 edition is only available online. A biosecurity incursion poses one of the greatest threats to the New Zealand Plantation Forest resource. If an incursion was to occur, the industry would need to be able to respond in conjunction with Government, to protect the industry. The New Zealand Forest Owners Association (FOA) and the NZ Farm Forestry Association (FFA), acting on behalf of New Zealand plantation forest owners, plan to apply to the Biosecurity Minister for a biosecurity levy under the Biosecurity Act. This letter to forest owners – such as Forest Enterprises investors – contains the proposal details and contact points if you wish to get more information or discuss the proposal. Forest Enterprises Special Projects Director, Steve Wilton has been made a Fellow of the New Zealand Institute of Forestry at the 2018 AGM on 9 July. The honour of Fellow is bestowed on a member who has been recognised by NZIF peers as having achieved eminence in the profession. We congratulate Steve on this most deserved honour. 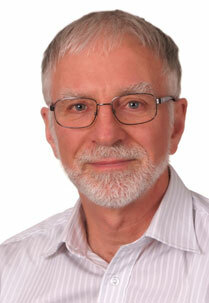 Read Steve’s bio on our website. Innovators continue to find new ways for wood products to improve our lives. This renewable resource has long been used in new construction methods, fuel and adhesives, and now in footwear and even alcoholic beverages. Forest Enterprises is the business name of Forest Enterprises Growth Limited and its subsidiary Forest Enterprises Limited. Forest Enterprises Limited is licensed under the Financial Markets Conduct Act 2013 to manage Managed Investment Schemes (excluding managed funds) which are prmarily invested in forestry assets. ©2018 Forest Enterprises Limited. All rights reserved. Forest Enterprises is the business name of Forest Enterprises Growth Limited and its subsidiary Forest Enterprises Limited. Forest Enterprises Limited is licensed under the Financial Markets Conduct Act 2013 to manage Managed Investment Schemes (excluding managed funds) which are primarily invested in forestry assets.